I have a festive cocktail for you today. It’s perfect for serving to your Thanksgiving guests – no shaker required. Just whip up a pitcher of this and serve it all day long. Couldn’t be easier! This sangria is wonderful for this time of year…which is weird to me because when I think of sangria, I think of summer. It strikes me as a warm-weather drink. Maybe it’s just me. 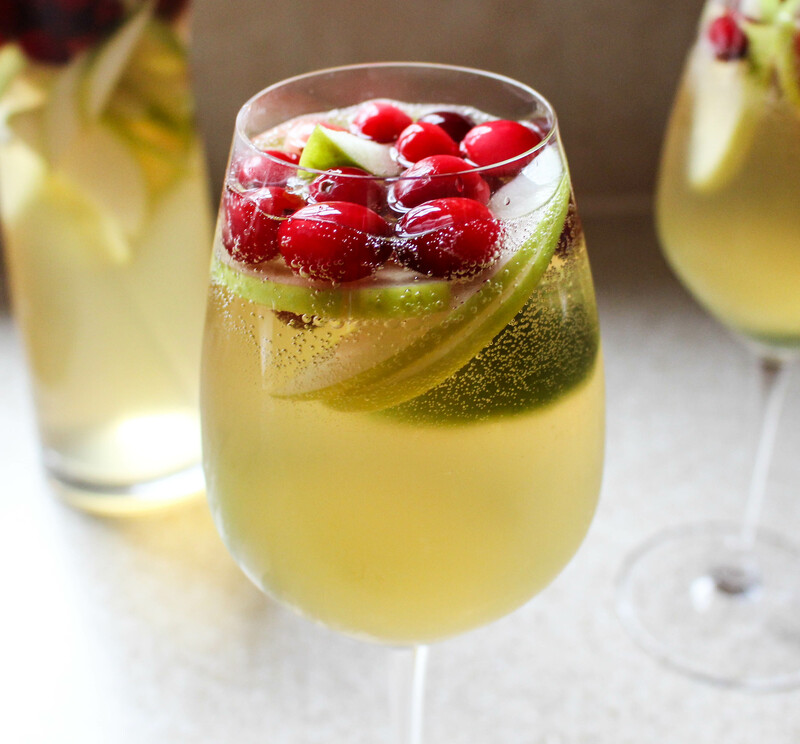 It’s just that sangria is usually light and crisp and chock-full of yummy fruit. These characteristics pair perfectly with those of warm summer evenings…complete with lightening bugs, burgers on the grill, lingering sunsets, and…ankles covered in mosquito bites. Er, sorry for that last visual, but it’s true for me! I’m their victim of choice. In recent weeks, I’ve seen many variations on standard summery cocktails, like margaritas, that have a seasonal twist. Not that I need to be talked into drinking a margarita in the dead of winter! Margaritas, no matter when consumed, remind me of warm sun and bowls upon bowls of chips and salsa. Mmm. Nothing wrong with that when it’s freezing outside! Aside from the margarita, however, I struggle with drinking summery drinks at this time of year. I mean, you won’t find me with a mai tai in hand after Labor Day (likewise with my white cranberry cosmos after March). This cocktail challenges my notion of seasonally appropriate drinks. It is warm, effervescent, and punchy all at once. 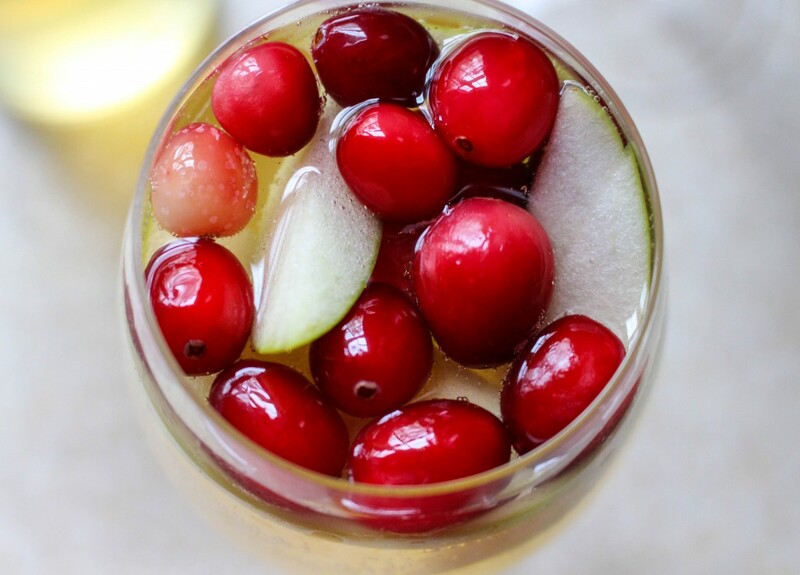 The addition of ginger liqueur gives it that warm spiciness we all know and love this time of year, and the bright flavors of apple, cranberry, and lime keep things fruity and balanced. 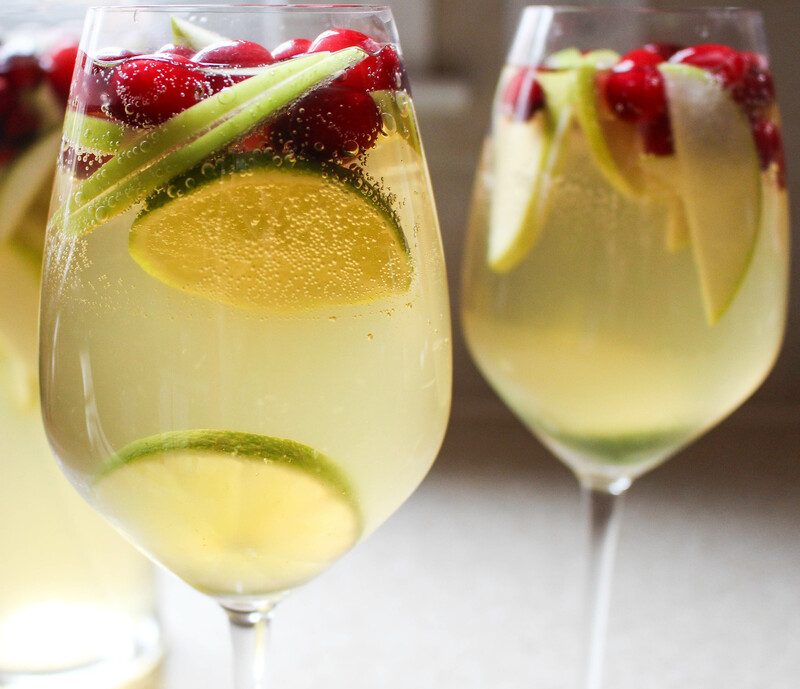 So, while I’m calling this a “holiday” sangria, feel free to make it year-round. Just like those margaritas. No judgement from me. 1. 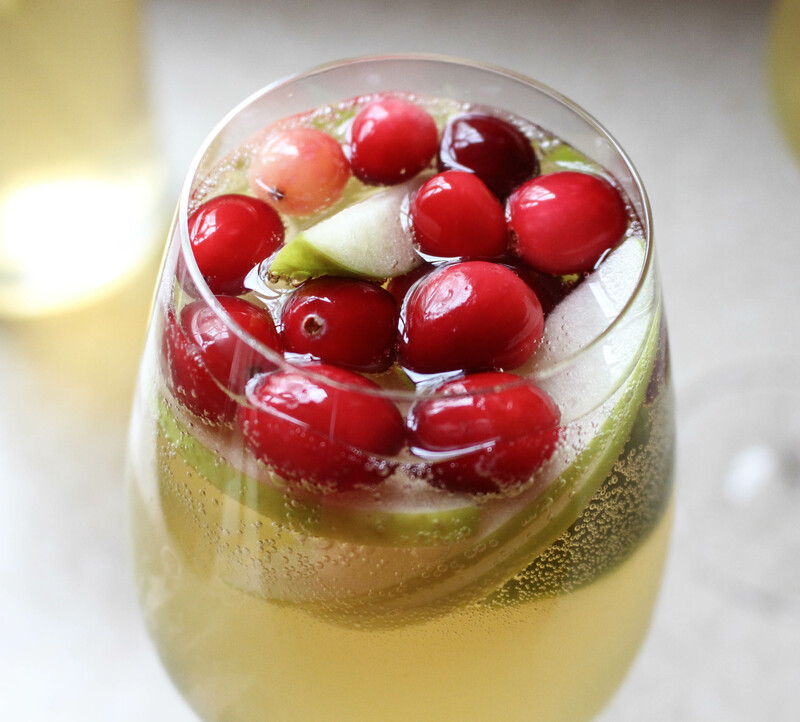 Combine the wine, liqueurs, and white cranberry juice in a large pitcher. Stir well to combine. 2. Add the sliced apples, lime, and cinnamon sticks. Give a good stir and then transfer the mixture to the fridge to chill for a couple hours. 3. Before serving, add the frozen cranberries to the mixture (Note: I wait to add them at the last minute because as they defrost, they turn the sangria a light pink color…which is totally fine, but I wanted to keep it as “white” as possible). Taste to see if it is sweet enough, and if desired, add the maple syrup (I ended up using about 1 tablespoon). Pour into chilled glasses and top off with ginger ale for a little effervescence. Garnish each glass with a cinnamon stick and serve! Disclaimer: I forgot to garnish the glasses with cinnamon sticks for the photos, but I added them before consuming! Do it! Molly, I am going to make this tomorrow for thanksgiving, thanks for posting. although I am thinking of possibly using pear instead of apple…I love Canton Ginger Liquor, its one of my favorite additives! I am going to take out the qpple liquor though because I don’t like sweet too much, with the ginger I think it will be good enough for me. I will let you know how it goes! thanks for posting! Happy turkey day! What size bottle of wine did you use?